Freight is free on any order of 12 bottles or more, $7.50 for anything less than 12… anywhere in the country. That's right, anywhere. Even Tasmania! I'm not sure if you noticed it but we have 14 bottle cartons. Pretty cool huh? 2. Who will deliver my order and how long will it take? Alternatively, during the checkout process you can elect to have the your wine left at the delivery address in a specific location i.e. under the verandah, behind the side gate, in the dog kennel etc. if no one is home. Doing so removes the requirement for a signature and passes on responsibility to the purchaser for any issues that may occur post delivery i.e. wine gets damaged by inclement weather, some bozo flogs it etc. Wine will not be left unattended even if requested by the purchaser if the delivery person deems it unsafe to do so or if it is easily accessible by any person under the age of 18. Delivery can take up to 10 working days, but this time frame can be shorter depending on the overall pressure on the delivery network at that particular time, your distance from major centres and product availability. 1. Can I send wines to people living in Australia from overseas? Absolutely! winedirect.com.au uses the specialised wine delivery network at Australia Post to deliver your goods direct to doors all across Australia. 2. Can wine be sent to countries other than Australia? At this stage we currently do not have an export licence to be able to deliver overseas. We are looking into this option so stay tuned! 1. How do I buy wines on your website? It's easy! Check that you are over 18 years old. Select what you're after, proceed to the cart or checkout, login or create a new account, follow the steps to payment, select your payment method and Bob's your uncle. A confirmation email will be sent to you immediately after to confirm your order. winedirect.com.au supports the responsible service of alcohol. It is against the law to sell or supply alcohol to, or to obtain alcohol on behalf of, a person under the age of 18 years. 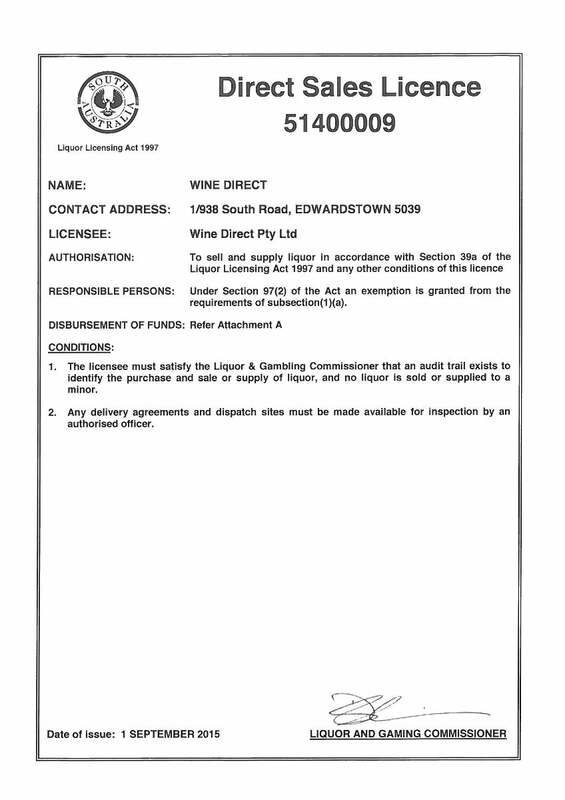 winedirect.com.au holds a Direct Sales Licence under the South Australian Liquor Licensing Act 1997, Licence number 51400009. If you have any trouble at all please call us on 1800 64 9463 or email us at help@winedirect.com.au. Wine Direct Pty Ltd use eWay to process your credit card payment. eWay stores your card information remotely and securely so that you only need to input the information once. Your complete credit card number cannot be viewed by Wine Direct Pty Ltd or any outside party. We never permanently store complete credit card details on site. Please visit www.eway.com.au for more information. 1. Can I order a wine that is not listed on the website? Of course you can! We source all kinds of wine not featured on our website… finding stuff is what we're really good at… car keys, remote controls and especially wine. If you would like to purchase a wine that is not listed on our website either call our Freecall number, 1800 64 WINE (9463) (AEST 9.00am to 5.30pm) or email info@winedirect.com.au and tell us what you want, what you really, really want. 2. The product delivered to me is faulty, what do I do? Contact us at Freecall: 1800 64 WINE (9463), fax us at: +61 8 8234 0781 or email info@winedirect.com.au within 24 hours of receiving your order. Our Wine Goodness Guarantee means that you never have to worry about wines purchased from us. We will replace any faulty products as promptly as possible. 3. How do you select your products? We only sell wines that we would drink ourselves. We taste every bottle that we sell and will only put forward those which we feel are outstanding to drink or, at least, outstanding value. This is in line with our philosophy of providing our customers with quality wines at whatever price points they choose – every bottle that you see on our website has been selected to these strict guidelines governing quality and value for money. 1. How do I find wines on your website? To look for a specific wine, enter the full name of the wine in the Wine Search box at the top. If you are unsure about the name of the wine, you can browse wines through the categories in the menu. Once you have selected the product type you are looking for, you can filter the displayed wines through the filter panel. You can filter by wine type, varietal, region, winery and price. If would like to order a specific wine that you cannot find on our website, please do not hesitate to contact us at Freecall: 1800 64 9463 (WINE) or email info@winedirect.com.au. 2. I would like to register on your website. How do I do that? Through the Account section. If you do not want to register with us but still want to receive our Specials Offers, just enter your email address on this page or anywhere you see the where you see the Specials List or Newsletter sign up box. 1. Who do I contact for Wine Club enquiries? You get to enjoy a significant saving on quality Australian wines that are hand selected by our tasting panel. Some of the wines included are sought after and hard to get wines from boutique wineries not normally available from retailers or even cellar door. It is also extremely convenient as the wines are delivered directly to you. There is no commitment – you cancel your subscription anytime, or skip an order simply by logging in to your account or contact us at Freecall: 1800 64 9463 (AEST 9.00am to 5.30pm), fax: +61 8 8234 0781 or email us at wineclub@winedirect.com.au. 3. What if I need to hold my Wine Club order? 4. Can I change the wines in the Wine Club dozens? 'Fraid not… the wines in our Wine Club dozens are specially selected for their quality and value for money. By being a member, you get to enjoy all these benefits. Rest assured with our choices, we will only offer premium quality wines that we would enjoy ourselves.